I joined the throng of photographers at Maroon Lake at dawn to shoot Maroon Belles. I sort of promised my daughter that I would shoot Maroon Belles if it did not interfere with any other plans and since the aspens were turning late elsewhere in Colorado this year, I really had nothing better to do. As we waited for sunrise, which was a dud, a group of us enjoyed visiting (a guy from Nebraska, another from Vegas, and a lady from San Diego). After the sun came up, we kept hanging out talking and comparing notes for a couple of hours until finally my feet got cold and I had to bug out. 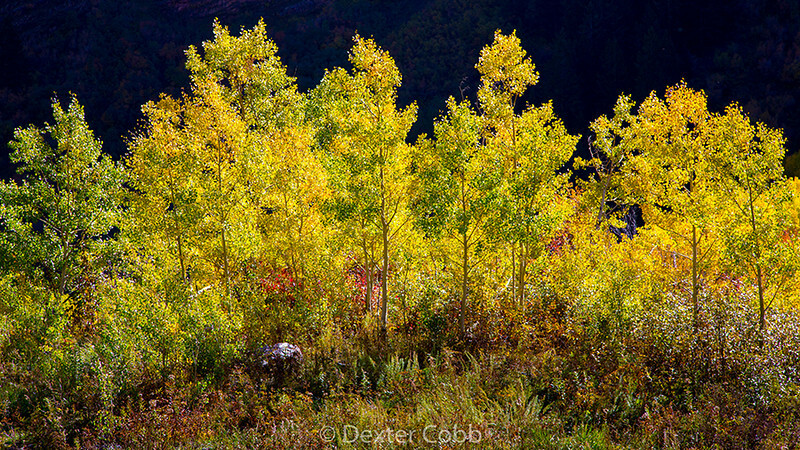 On the way out on Maroon Creek Road I spied these backlit aspens with a shaded hillside behind. So I got busy shooting quickly for fear the light would change. Not to worry, the scene stayed similarly lit for about 20 minutes. I just love the contrasting yellow and blues (caused by the shaded hillside in the background) here. Simple elegance.